People complain about their headache as they trace their eyebrow with their fingers. This is the pattern that happens right in the eyebrow. There are other patterns that happen above or below the eyebrow. Further assessment is needed to pinpoint this trigger point. The sure sign is when I press into the corner of the jaw (where the green asterisks are) and the headache intensifies. When I’m working, I may ask about pain in the teeth or jaw when I find this trigger point. They usually associate it with a tooth problem and something that dentist should address instead of the massage therapist. They often brush it off as something they have had and need to get their teeth checked, I am sure to ask before and after treatment as well as the following session to help them understand that it is part of the trigger point referral. I always encourage them to follow-up with the dentist, even if I have eliminated the pain and discomfort. 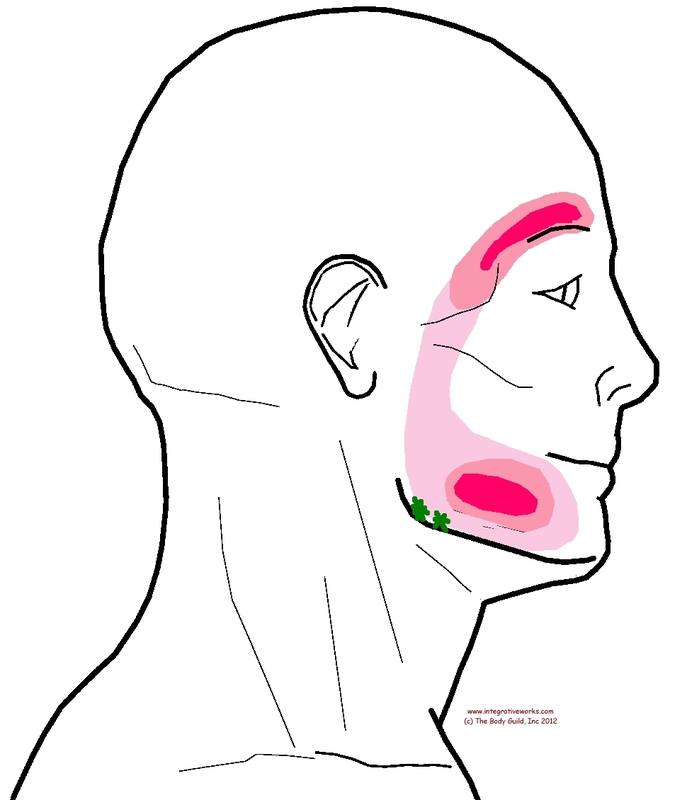 The trigger points, indicated in green, are near the angle of the mandible and are usually very sensitive when pressed. The whole pattern is usually not reported unless the pattern is very active and the client is asked about details. This brings up an interesting note about the trigger point illustrations. The darker areas are darker because of how often they are a part of the pattern not because of the intensity of the referral. I was hospitalized for a week with migraines during one Christmas season in my 20s. By the way, I worked for that hospital as the IT manager of one of their billing companies. My boss assured me that they would take good care of me. I paid a lot to have them tell me that they did not know what caused the headaches. Those headaches were awful. They would start as a dull ache in the morning and I would be shut down by the evening. Several months later, the headache returned. I had a toothache in the roots of those molars as well. I got out the yellow pages. I had gotten my first massage a few months earlier from a guy who had recently taken neuromuscular classes. (By the way, he is now a regular client of mine.) I went to a neuromuscular therapist who gave me a great deal of relief in an hour for $40. I saw her weekly for quite a while. I had no idea at that time that I would end up writing about NMT. 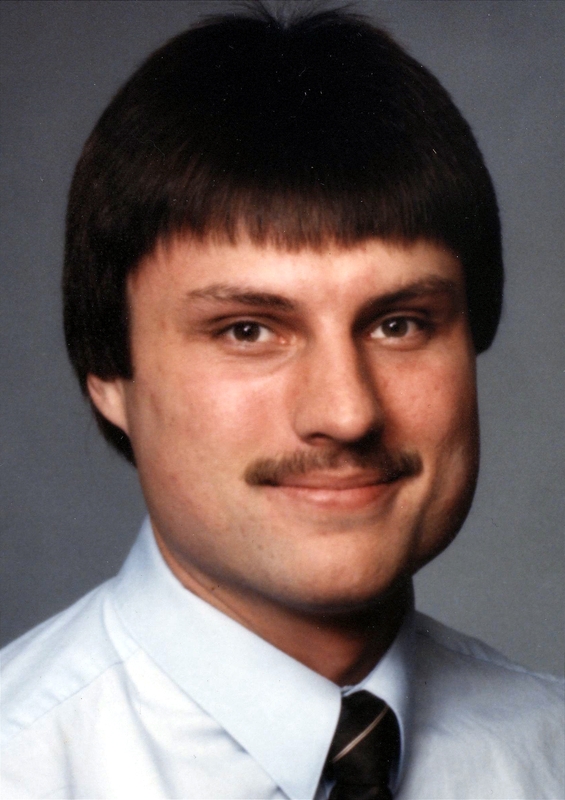 Here is a picture of me, 24 years later, sitting in my weight room. The hair ain’t much better. I created my TMJ issue by grinding my teeth while weight-lifting and chewing on pens at work. I’ve had people come to me with similar problems from chewing on toothpicks or grinding their teeth at night. Most people do not have a good explanation about why their jaw is so large or tight. This usually develops as a problem that is secondary to imbalances in the cranium and neck. You can get temporary relief with Ice and Stretch. Use the ice on the jaw and then stretch by opening the jaw wide and moving it from side to side. Here’s a post on the basics of ice and stretch. When I have clients come in with TMJ problems, the first thing that I do is have them sit up, lightly touch their teeth and then rotate their head around in circles. Try it. You’ll see that your bite changes as the position of your neck changes. One of the most effective steps to addressing TMJ is to resolve upper cervical problems. Most people require some therapeutic intervention to get lasting results. This muscle also refers irritation into the molars and needs to be addressed. I got my biggest changes from neuromuscular TMJ sessions following craniostructural therapy. Masseter is a powerful muscle and can be difficult to release, especially in this deep section. As usual, balancing the joints and structures around the jaw will make it easier to release with lasting results. Start with the upper cervicals as mentioned above. When I started using cranial work to release the joints before addressing the trigger points, they just melted. Cranial work is the key to faster, longer lasting results. Cranial work reduces treatment time, and discomfort while creating more dependable, longer lasting results. Ice and stretch also makes this process easier for the therapist and client. I’ve now helped hundreds of people with headaches like these. I love my job.